Access to safe and affordable long-term housing is critical for survivors of human trafficking as they seek supportive services, justice, and, ultimately, heal. Affordable housing programs, including transitional and long-term, often have long waitlists and may restrict eligibility based on immigration status, criminal history, rental history, or current income. The housing landscape is truly complex and can be difficult to navigate.  The Freedom Network Training Institute (FNTI) provides advocates dynamic and up-to-date training and resources on housing options for survivors of human trafficking. The training, tools, and resources offer information and guidance for advocates in accessing appropriate emergency, transitional, and long-term housing options for survivors. FNTI’s Housing Training and Technical Assistance Project includes a wide array of expert consultants, including a Survivor Advisory Panel, supporting the creation of tools and delivery of training. You may access and share our materials by visiting the Resource Library. Feel free to contact us with any specific requests using our ‘inquiry’ link below. This Technical Assistance Session is a follow-up to the the webinar on Effective Collaboration Between Anti-Trafficking & Domestic Violence Programs. Expert panelists respond to questions on best practices for safety planning, funding, eligibility and effective collaboration. Due to technical difficulties, the first 15 minutes of the call were not recorded. Domestic violence (DV) shelters are often utilized as emergency housing for survivors of trafficking. 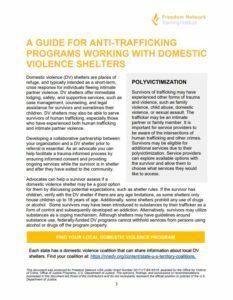 This guide provides anti-trafficking programs guidelines on assessing if a DV shelter is a good fit for a trafficking survivor and ideas for creating effective collaborations with DV programs. 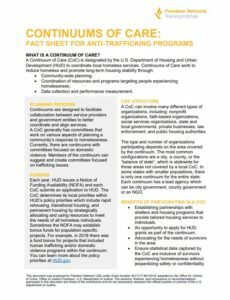 This fact sheet provides an introduction to Continuums of Care (CoC) and explores how anti-trafficking organizations can collaborate with their local CoC. Fill out the form below to contact our project staff. Please allow three business days for a response. This webpage was produced by Freedom Network USA under Grant Number 2017-VT-BX-K018, awarded by the Office for Victims of Crime, Office of Justice Programs, U.S. Department of Justice. The opinions, findings, and conclusions or recommendations expressed in this webpage are those of the contributors and do not necessarily represent the official position or policies of the U.S. Department of Justice.